Our group had a great Green River Tour. 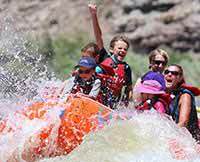 Friends and I just went on the July 4th Green River rafting trip out of Moab, Utah. We had knowledgeable, confident guides who were kind, entertaining and fun to be with. My group had a great time! This was a well organized trip with everything happening right on schedule. FUN, FUN, FUN!! !